Eye patches for sleeping, otherwise known as sleep masks, are essentially two pieces of material that cover the eyes when one is asleep. Some kinds of eye patches can be worn during the day for numerous reasons, one of the main ones being to help correct amblyopia, more commonly known as lazy eye, in children. These eye patches are different to sleep masks, however, in that they only cover one eye, and their purpose is to get the lazy eye to work. 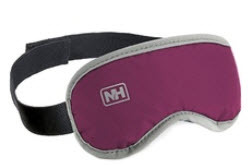 Sleep masks, on the other hand, are made to cover the eyes, and the surroundings are blocked out so that no light gets to the person’s eyes as they sleep. They are usually made of a material such as fabrics like silk or cotton, or sometimes a soft, non-abrasive plastic. Some of the plastic ones can be filled with a gel or liquid to give a similar feel to a waterbed, while some of the fabric ones can be filled with herbs for an aromatic experience. Sleep masks are almost always kept on with an elasticated strap. There are many reasons a person might choose to wear a sleep mask, but the most obvious one is to help them sleep comfortably throughout the night. Sleep masks block out all light, making it not only easier to fall asleep but ensuring that you can stay asleep without any light disturbance. This means that they can be especially helpful to people who get disturbed easily, or have sleep-related problems. There are large many medical benefits to sleeping properly, so using a sleep mask can help with these. The hormone melatonin is produced in your body only when it is dark but has many functions including setting your body clock and stopping your DNA from becoming damaged. REM sleep, the period of sleep where the brain is particularly active, and most dreams occur, is important for both memory, and general cognitive function. A lack of sleep can reduce both of these, which in turn can affect long-term memory, make complex tasks more challenging and also potentially increase the risk of cancer. These are all on the top of the list of general symptoms of fatigue. In addition to the more well-known benefits of sleeping properly, putting a gel-filled sleep mask in the fridge and then wearing it can help reduce puffiness and circles around the eyes, as it acts similarly to an ice pack, creating a soothing sensation. Conversely, a gel-filled sleep mask can be heated in either warm water, or a microwave can help with swelling or when you are feeling congested due to a cold, and can also be especially relaxing if worn to sleep. Which sleep mask should I use? Generally speaking, you will see two types of sleep mask – ones made with fabric, and ones made with gel in them. Neither is particularly superior; the gel ones can be heated or cooled for certain benefits, but the fabric ones are cheaper. There are numerous designs for both categories, but ultimately it comes down to whichever one feels most comfortable on your face.